Blogging the Beatles 25/26/27: “Ticket to Ride”/”Yes It Is” and “Help!”/”I’m Down” singles, and Help! The year 1965 rolled in for the band with an already tight schedule–the first two weeks of January saw them finishing up their lengthy Christamas show ‘revue’ at the Hammersmith Odeon that had started 24 December, same as last year’s. After a few weeks of well-deserved rest, it was time to jump back into the fray in mid-February. Between 15 February and 11 May, they would be busy not with a tour or the endless radio and tv appearances, but jumping between recording studio, film studio and other locations for their next film project. At first entitled Eight Arms to Hold You (officially given the name–another Ringo malapropism!–on 17 March during the Austria location shoots, until it was changed a month or so later), this new film would strive to be different from the semi-biographical A Hard Day’s Night. It would not only be in color, it would also be a completely fictional story. This second movie would also be directed by Richard Lester and produced by Walter Shenson, though screenwriter Alun Owen was not retained. In retrospect, the lack of snappy, funny dialogue and smart plot that permeated the first film would be part of its faults–the “Beatles on the run” theme is turned into a farcical chase between a religious cult who want Ringo for their next sacrifice, and the boys are relegated to a lot of what sounds like halfhearted ad-libbing (most of which was inspired by their use of marijuana at this time)–but regardless, it would be a hit as expected. And with a new film project meant new recordings. In between filming (and the occasional one-time appearance here and there), they returned to Abbey Road Studios to record their next batch of songs. As before, they’d planned on doing a half-album’s worth of actual soundtrack songs on Side One, with new album tracks on Side Two, with the occasional non-lp single here and there. In this case, they’d record two non-lp b-sides this time. It was a crazy and busy schedule to be sure, but at the same time, it actually worked to their advantage. Unlike the previous movie, which had a relatively tight script, this one left things open to chance, with many scenes filmed but never used. When they needed to be filmed performing new songs, they were often new tracks that had just been written a few weeks previously. 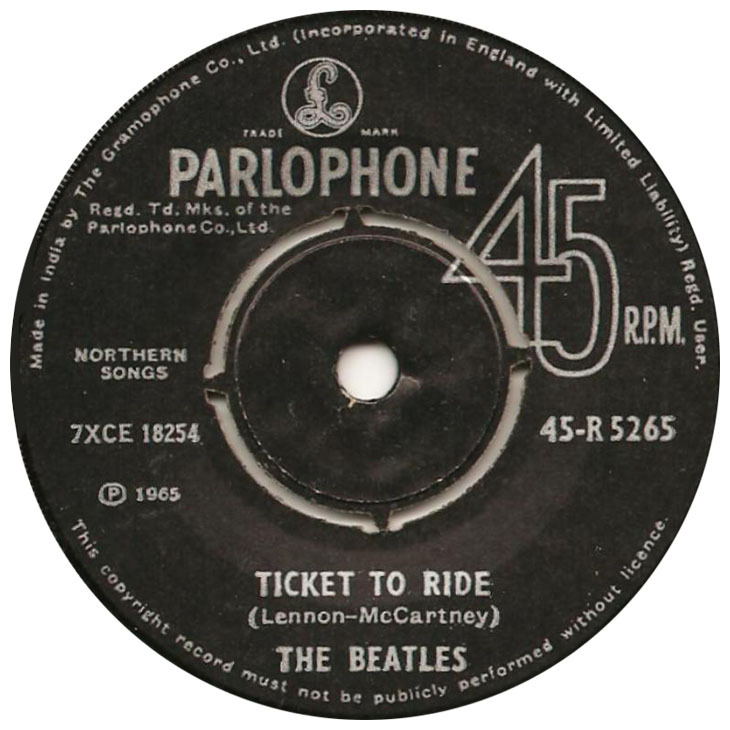 This happens plenty of times: “Ticket to Ride” was recorded on 15 February, filmed in late March in Austria, and released as the lead single in early April; “I Need You”, started on the same day, was filmed in Salisbury Plain in early May; “You’re Going to Lose That Girl” was started 19 February and filmed in a fake-EMI studio on 30 April. The filming would finish on 11 May, with post-production (overdubs and whatnot) finishing in mid-June. The movie itself would be released in the UK on 29 July and worldwide soon after. The album recording would finish on 17 June, with George Martin doing the final mixing days later. Now it was time to return to Beatlemania: new singles, new album, more touring, more radio and tv appearances. Their summer would be jam-packed again, only to have them return to the studio again in August for another album come August (thankfully, they were given six weeks off in between, so they could recharge). In some ways, 1965 could be considered a rerun of the previous year, but with some differences–they no longer had to puddle-jump all over Britain to appear everywhere, and sonically they sounded even better than every before. Still, it had already started to wear on them. Interestingly enough, one idea they had come up with to combat this was to send out pre-filmed performances, something they had come up with late in 1964 for “I Feel Fine” and a few other songs. The benefits would be two-fold: they would not need to visit every television studio and perform the same song endlessly, and they could also make as many copies as needed and have them sent out to television studios, who could then insert them on any show they chose. This could be considered the birth of the modern music video; a simple but effective promotional tool and also a quick and easy way to get out of physically appearing on everyone’s shows. By 1966 when they stopped touring, this would become the only way you could see them performing. The first new single of the year was also the first to break the three-minute mark in a Beatles single. It’s also a change in sonic direction for the band; the straight-ahead rock of 1963 and 1964 had become infused with more folky sounds, thanks to the influence of Bob Dylan and the burgeoning folk scene in the United States. These tracks take their time unfolding, giving the listener a chance to pay attention to what’s going on underneath. At the same time, George Martin had suggested a new approach to recording: instead of attempting multiple takes of the same song and hoping a gem would surface, they would let the songs grow organically. They would record the backbone of a song with minimal instrumentation, leaving them room to overdub when necessary to build up the track. In this way, there would be very few actual full “takes” and much less tape used, and more creativity being given to the details. The Help! singles and album would definitely have their share of quick-take rock songs they were known for, but their sound had definitely matured because of this approach. The new single opens up with a beautiful, chiming riff courtesy of Paul McCartney, who also happened to suggest the curious, slightly off-beat drumming to Ringo, which you hear next. Moments later John steps in and gives us a stellar vocal delivery about his girl leaving him. Unlike the downbeat lyrics of many of his Beatles for Sale lyrics, however, this one is almost a return to their earlier lyrical sound–it’s less introspective and a lot simpler. He knows he can’t do anything about her leaving, except feel sad, even when he tries to convince himself that “she ought to think right, she ought to do right by me”. She really doesn’t care what he thinks–she’s out of there, and there’s not a damn thing he can do about it. One can definitely hear the outcome of Martin’s new approach to recording–the band-as-a-cohesive-whole is still there, especially with the changes in tempo and the deft harmonies of John, Paul and George, there’s also a fuller sound, with plenty more to hear. There are layered guitars and strong additional percussion right there in the foreground, and John’s multitracked vocals sound rich and full. Musically it’s similar to their recent previous output, but they’ve given it more life. John often dismissed this track as a failed attempt, and one can kind of understand his reticence…it’s almost a slower, sadder “This Boy” without the pleading middle eight. On the other hand, that’s it’s strength: it features absolutely beautiful three-part harmony from John, Paul and George (recorded live and not separately, I should add), and though its bridge is more sedate, recalling the self-deprecation of John’s previous songs like “I’m a Loser”, it’s still a strong piece. Of note is George’s guitar playing, this time with yet another new toy: a tone pedal (later dubbed the ‘wah-wah’ pedal), which gives his meandering notes a plaintive touch. The next single would be the all-new theme song for their next movie, which would premiere the following week. 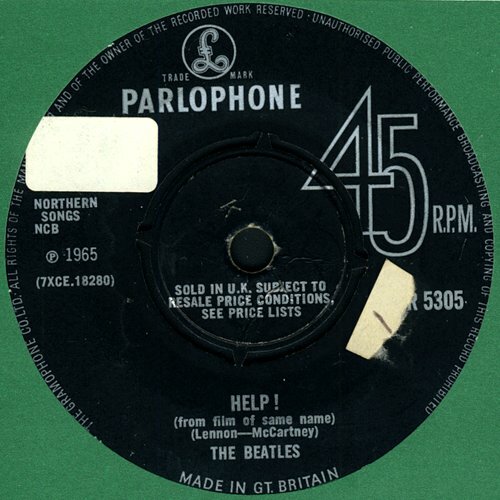 Both tracks featured sounds that fans hadn’t expected: “Help!”, while quite an upbeat number, is also an extremely folky one, not to mention one of John’s first truly heartbreaking songs about his insecurities; on the flip side, “I’m Down” is a barebones, nothing-held-back rocker that ended up being a concert favorite of theirs. It was a hint of even better, more personal things to come. One of the main reasons for John’s writing the song–aside from it being a real cry for help–lies in the band’s and the director’s indecision on what to name the new movie. Richard Lester had been calling it Beatles 2 or some version thereof, and the semi-official title early on had been Eight Arms to Hold You, in reference to the multi-armed Hindu goddess Kali that is part of the movie’s main plot. John and Paul didn’t like the title, mainly because they really didn’t want to write a song with such a mouthful to sing, and instead came up with the movie’s other main plot: the band on the run and unable to find the help they need to save themselves. The song itself, as mentioned, is quite upbeat–it’s one of their faster tracks of the time–but the lyrics are quite unexpected. Never before had John been this bare in his emotions. It’s not just about the imagined conflict of the movie, but the stress of life: the feeling of drowning, the inability to find a foothold, the loss of direction. John’s delivery is desperate but not whining–it’s breathless and just this side of breaking, and Paul and George’s harmonies serve not just to punctuate the cry for help, but to bring that tension that much closer to the surface. It’s a simply-written melody, but it’s relentless and doesn’t let up until the final exhalation of “ooh’s” at the end. This is a fascinating track of Paul’s, and a revisit of Britain’s fascination with American soul at the time. It’s very reminiscent of their earlier “Long Tall Sally”, but where that track is tight and rocking, this one is purposely disjointed and full of spite. They turn a simple twelve-bar blues riff into a track that threatens to fall apart every time it comes to the chorus, there’s so much tension. Even the lyrics are accusatory: instead of the usual “you’re making me blue” they delivered in the past, it’s now become almost a “how dare you make me feel this way” (“How can you laugh when you know I’m down?”). This track soon replaced “Sally” as their show closer on their international tours (an incredibly spirited version from Shea Stadium in New York can be seen here). One interesting side note is the studio chat in between takes 1 and 2, when Paul comments on the song, saying “Plastic soul, man…plastic soul.” [This can be heard on the version of “I’m Down” on the Anthology 2 album.] The origin of the phrase is unknown, but it’s said that a black musician had used it to describe the appropriation of American soul by white British musicians, specifically Mick Jagger and the Rolling Stones. By the end of the year, it the phrase would be slightly changed and a new album name would arise: Rubber Soul. The first Beatles album of 1965 (and the second soundtrack of their career) was released a week after the UK premiere of the movie, just in time for midsummer. The movie itself, while not nearly as clever as A Hard Day’s Night, was full of music, silliness, and capable acting by the foursome, and both the movie and the album quickly became hits of the year. Another interesting outcome was that it introduced eastern music to the band, specifically George Harrison, who would introduce the sitar and other eastern instruments to the band. The foreign sounds didn’t show up on this album, but the change in direction towards folk and balladry definitely did. 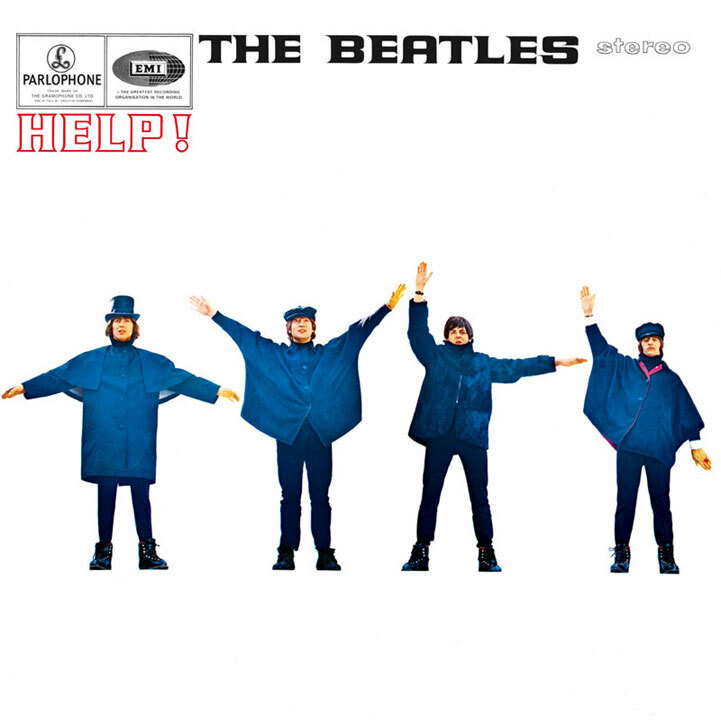 Given more time than the rushed production of Beatles for Sale, Help! features the band spreading their wings and testing out even more creative ways to define their sound. As before, the album starts off with the theme song. The movie uses this song in quite a cheeky way: after the prologue, we see the foursome playing the song in black and white, a nod to their previous film. Only eventually do we notice that darts are being thrown at it by the evil-but-pathetic Klang (played to amusing effect by Leo McKern), hinting that, honestly, that’s the most harm this so-called villain could cause. Another track recorded early in the process, this one was first laid down on 17 February. It’s a typical Paul track that might have fit nicely on Beatles for Sale, so similar is the sound and feel. It’s a surprisingly sparse track, actually–aside from John’s electric piano playing and George’s short but fun solo, there’s not too much that stands out here. In fact, all the instrumentation stays in the background and doesn’t venture too far, saving the front end for Paul’s strong vocals. Of note here, however, is a reference to a drumming trick Ringo used on “I Want to Hold Your Hand” a few years earlier: he plays a loose high-hat through most of the track, only to close it for effect on the quick bridge (during “…last night is a night I will remember you by”). It’s a simple song, but it’s fun. This one appears during the extended Salisbury Plain scene, the second of two songs they’re trying to record surrounded by soldiers. John returns here with an overt nod to Bob Dylan, right down to the bare, raspy vocal delivery and the jangly acoustic guitar. It’s an absolutely gorgeous ballad in 6/8 time that extends on the insecurities he sang about on the title track. Here, he’s been beat down and made “two foot small” to the point that he doesn’t dare show his emotions, for fear that he’ll only get hurt again. Even when someone tries to lift his spirits (“How could she say to me ‘love will find a way’?”), he shouts back with a “Hey!” during the chorus, refusing to play along. Recorded on the same days as “Yes It Is” (thus the return of the tone pedal on this track), George’s first of two offerings for the album is a summery love song similar to “The Night Before” in that it’s sparse and quite acoustic. It’s even used during the same Salisbury Plain scene. It’s not one of George’s stronger songs lyrically or even musically, but on the other hand, it’s actually a good example of how different his songwriting is to John and Paul’s. It’s a simple love song on the surface, but underneath all that, there are a handful of offbeat elements: ending the verse melody on a seventh note, using the guitar melody to “respond” to the vocal melody, things that John and Paul wouldn’t normally put in their own compositions. Another Paul song recorded the same day as “Ticket to Ride” and “I Need You”, so it definitely shares that acoustic vibe. The track starts off with the chorus, right down to the “…for I have got / another girl” incomplete sentence (it ties in with the end of the previous verse later on in the song), and is full of folksy goodness. Like the other previous similar songs, the instrumentation is secondary to the vocal delivery, and in retrospect that was very much key in the folk songs of the time. The song isn’t all that adventurous either, but it does hint at the old skiffle sound they grew up with…one can easily hear this being played by a young John and Paul with their friends on washboard and other homemade instruments. Filmwise, this song actually works in its scene, shot on a rocky shore in the Bahamas, inciting a laid back, summery feel. A rather quick song from John, this one doesn’t get anywhere near the personal demons of the previous songs. Instead, it’s a track similar many of his early love songs, only this time he’s warning his friend that if he doesn’t watch it, someone (namely John himself!) is going to take his girl away from him. This song can easily be seen as a nod to all their previous hits, such as the call and response vocals of “Twist and Shout”, the talking to a friend of “She Loves You”, and the downside of relationships of Beatles for Sale. The soundtrack side ends with the first single, simply one of their greatest tracks of the time. The song features in a classic scene in the film with them miming to the song in the Austrian Alps with grand piano, skiing and sledding, falling about themselves, and having a fun time. Ringo very nearly didn’t have a vocal track on this album, due to the fact that John and Paul’s offering of “I’ve You’ve Got Troubles” (recorded but never released until Anthology 2) was rejected as a failed attempt, the band quickly relied on their extensive back catalogue of cover songs they knew and loved. In this case, they took the 1963 Buck Owens country hit and turned it into a fun and pleasant Ringo track. Having noticed that country songs fit well with him, such as the previous “Honey Don’t”, it was a perfect fit. In 1989, Ringo and Buck would record it together as a duet. Both Paul and John have admitted this was a throwaway song with uninspired lyrics–in fact, it’s kind of a bland ballad with many stereotypical tricks inherent in that kind of song (the pleading vocal, the lyrics describing a rough relationship, the melody relegated to the background). Still, only the Beatles could dismiss a song as such and still get away with a strong track. George’s wonderful guitar work, the creative uses of sixth and seventh chords, the delayed release of tension in the chorus…it might be a simple song and not very adventurous, but it’s still catchy and well done. George’s second offering was almost in the running for the film but was dismissed to this side instead. It’s not one of his strongest songs–he was a good writer, but clearly not in the same league as his bandmates. Still, it’s a very typical song of his, full of interesting and unexpected chord changes and melody lines that one wouldn’t necessarily hear in a pop song. Added to that, both John and Paul added some wonderful keyboard work here, with Paul on piano and John on a much more upfront electric piano. The call-response of John and George during the solo is simple but creatively done. Another John/Paul duet, right down to the dual vocals. Neither remember much about this track, hinting that it might be another throwaway, but it does have its interesting quirks. It’s full of percussion in addition to Ringo’s drums. There’s a guiro, claves, and a tambourine all throughout the track, blending in almost seamlessly with the rest of the track. There’s also the breakdown right at the end of each chorus, with the electric piano bringing it back up to speed until the last time around, where it’s used as an outro. Like “I’ll Be Back” on A Hard Day’s Night, this track and the next feel completely out of context with the rest of the album, partly as they were some of the last songs to be recorded for these sessions. At the same time, they’re both perfect examples of just how fast their songwriting evolved, even within the span of a single album project. This track of Paul’s is purely inspired by country music, with an incredibly fast tempo and some absolutely stunning work from all three guitarists, from the layered 2/4 intro to the hoedown rhythm to the eighth-note solo. Paul’s wordy yet poetic lyrics are pure bliss. It feels more at home on the follow-up album Rubber Soul (it would in fact be released on the US version of that album), but here it’s used to hint at what’s coming soon. The Beatles were consistently at the top of the charts, but in the context of their whole oeuvre to date, they really hadn’t had a bona fide perfect song since “I Want to Hold Your Hand” or “She Loves You”. Then on 14 June–the same day the previous track was recorded–Paul finally laid down a song that had been running through his head for quite some time. The song had resonated with him so much that he was convinced it wasn’t his, but no one could prove otherwise. It’s a deceptively simple song, just a short but catchy melody about love and loss. There’s no resolution, no “it gets better” or “I wish she would return”…it’s just “she’s gone and I can’t get her back”…simple, but heartbreaking. It was recorded with just Paul on acoustic guitar that day, and three days later a string quartet was added, the first Beatles song featuring only one Beatle. The end result became one of the most covered pop songs in the world, and one the best songs Paul has ever written. To end the album on an upbeat note, they relied on an upbeat cover of a Larry Williams hit (they also recorded Williams’ “Bad Boy” on the same day, 10 May, and that track would only show up on the US album Beatles VI and not appear on any UK release until late 1966’s A Collection of Beatles Oldies). It’s another rocker similar to “Long Tall Sally” or “Money (That’s What I Want)”, played more for a party mood than a serious track, and they’re clearly having fun here. This is the Beatles finally releasing their tension with some good old rock and roll. After the fact, these two Williams tracks are the last cover songs the band would record as a group, not including the random covers played during the Get Back sessions in 1969; from here on in, they would only record their own compositions. Help!, the album, could easily be considered the point that marked the end of the band as a “pop group”. While there are certainly a handful of pop songs here that are a logical progression from A Hard Day’s Night (specifically its second side) and Beatles for Sale, their songwriting had moved well past the point of simple love songs and covers. Lyrically they’d started to dig well past the surface and into introspective and even philosophical territory, even while still retaining the catchy melodies. Despite it being a half-soundtrack to what was essentially an absurdist comedy film, it was their most personal album to date, even more so than Beatles for Sale, and the fans definitely noticed. And given the last few tracks on the album, it was clear that they were no longer going to keep writing and recording the same style of pop songs. By the time they returned in October to record their second album of the year, their songs would include one with a sitar, another with a piano solo recorded at half-speed to sound like a harpsichord, and a complex, multi-tempo track that would only see release as a single. Quick flyby–I’m getting there…thanks for your patience! So continuing from the PS to my previous post–I ended up purchasing a completely new PC to replace the old one, and am currently getting everything up and running. Again, sorry for the delay, and I hope to get a new post to you all soon. Thanks again for your patience. Note: As it just so happens, the PC here in Spare Oom has decided to have some serious issues in booting up this morning. This has been an ongoing issue over the last few months, and I’ve been hoping it would be minor, but today seems to be the worst–as of 11am PT it’s still running a Startup Repair, so I’m not entirely sure if it’s stuck in a purgatory loop or if it’s actually fixing itself. Either way…looks like it’s high time for me to do some PC shopping soon. I’ll try to keep to my expected schedule as mentioned below while using my laptop, hopefully it won’t be much of a problem. If it does end up screwing with my posting schedule, I’ll let you all know. Hi all, I apologize for the delay in updating. It seems that I finished up the major revision of the first novel in my sf/f series, A Division of Souls, a bit sooner than I’d expected, and have been using this time to get the manuscript (and its few extra bits) all nice and tidy for when I submit it to an agent. I hope to submit it within the next few weeks, so that takes precedence. In the meantime, not to worry, I have not forgotten to update the Blogging the Beatles posts, nor have I forgotten to do some Walk in Silence music posts either, I just have not had the time. I’m looking forward to a lot of these music posts, as they’re going to be covering quite a few great alternative albums from the 80s. As soon as I have something new up, I will post the links over at Twitter and LJ as well. I should hopefully have something up by midweek the earliest, or next weekend the latest. Also, thought you’d like to know that A. and I will be going to Outside Lands again this year, so sometime in August I will be posting pictures from it like I did last year. There are a lot of great bands playing this year, so I’m really looking forward to it. I do apologize for not letting y’all know sooner, and will definitely do better at keeping everyone updated when there’s going to be a delay. I know that I’m the rare music collector–I’m one who will download music, but also still head over to Amoeba on Haight Street and pick stuff up on a semi-regular basis. I did that yesterday as part of my slow-but-ongoing plan to weed out most of our cd collection, having gotten a good ninety dollars’ store credit out of a pile of titles that have been gathering dust in a closet the last few years. In the process, I spent a good hour or so digging through equally dusty clearance bins and making out pretty well. The dollar bins are my friends, because a lot of the time I can find stuff that I want that isn’t available digitally. As always, the time frame of the titles there are about ten to fifteen years ago (with the occasional exception–for some reason there were a lot of copies of Morning Parade’s album from last year in there), which means it aligns with a lot of the titles I remember seeing during my tenure at HMV and during my weekly jaunts to Newbury Comics back when it was in Amherst. In the process I also picked up a few new titles that we’d been looking for. In addition to this, I’ve been ordering a few import cds online lately–the recent and excellent reissues of We’ve Got a Fuzzbox and We’re Gonna Use It! !’s two albums from 1986 and 1989 being the latest–again, because they’re not available digitally. I’m also an obsessive when it comes to listening. I’m not sure how rare or how prevalent that is with others, but I’ve always got some music going on in the background wherever I am. Roadtrips? Got the local stations on the car radio. Work? Streaming something online. Working out at the gym? Listening to my mp3 player. Writing? Playing something from my digital collection. Not at my desk? If we’re not watching something, we’ve got one of the Sirius stations on. I’m not always focusing on the music, but I’ve always got it playing when I can. I’ve been that way since I was a young kid in the early 80s. In the past, I would find new music by listening to the radio–more to the point, once I became obsessed with indie rock, I started paying attention to new things and their release dates. Again, this really came to the fore once I started working at HMV, previewing them in the stock room before I brought them out onto the floor on Tuesdays. Even more so when I had my weekly Wednesday comic book/music purchase run in Amherst during the early 00’s. I fell out of the habit in 2005 when I had couple of major life changes, and I didn’t really get back into it until a good couple of years later. This would probably explain that gap in 2005-2007 where I kind of remember some indie music, but it doesn’t really stick with me unless I really look at the chronology. I got back into the habit around 2010-ish when I found Save Alternative, and later started actively looking for college and radio stations on the internet, and even more recently when my wife and I started listening to AOL Music’s Spinner. Interestingly, I rarely pick up new information from music magazines or websites other than release dates. I don’t have much against them, but while their coverage is similar to my tastes, they don’t converge enough for me to actually benefit. I say all this because lately I’ve been listening to college radio again. I’ve been listening to it for awhile now, but more so than in the last few years. Because nothing beats getting it from the source. I wish I could say I’ve got the Jonzbox plugged in and I’m taping stuff as it’s being played, but alas that isn’t true. I do still have a handful of blank tapes that my sister found lying around, and the Jonzbox still works, albeit just barely, but those days are over. As much as I’d love to tape radio shows again like I did so many years ago, a handful of the college stations I listen to are well out of range–some of them being on the other side of the country. That’s the beauty of the internet for me in this respect. I love being able to listen to WZBC out of Boston College one moment, and KSCU out of Santa Clara U. here in California the next. There’s also the fact that I can listen to any college station and not really know or expect what they’re going to play next, because for the most part they’re still freeform after all these years, bound only by their show’s theme. And despite not being able to record these shows, it does occur to me that I can do the next best thing–if I’m interested in a song, I can do what my wife and I have been doing whenever we listen to Sirius XMU and Alt Nation: write the songs down on Post-Its for further checking out and possible downloading. I just did that this morning, actually…while listening to a great set on KSCU, I wrote down a small handful of songs I liked and realized I could just as easily zip over to Amazon and download the mp3s whenever I wanted. While I miss out on recording the semi-professionalism and occassional silliness that goes on with student-run stations, it’s a small price to pay when I can instead buy the music immediately if I so choose, instead of waiting for the weekend/when I get paid to go to the local record store. And as I’ve mentioned earlier, most of my trips to Amoeba as of late have been for back catalogue. Still, I do like the idea of listening to the radio again, especially when it’s to listen on certain days for a specific deejay’s show. It’s a refreshing change from the daily (and sometimes hourly) repeat of the same sounds, and there’s a much higher chance of something new and unknown being played that will catch my attention. And by listening online, I also get to savor the sounds of different cities. Northern California’s college radio is a bit more lively and odd than New England’s laid back autumnal sound, for instance. It’s a pleasant reminder that just when I’m in the mood for a specific sound, or sick of the same music being played, there’s a hell of a lot more always out there that I haven’t tried yet.